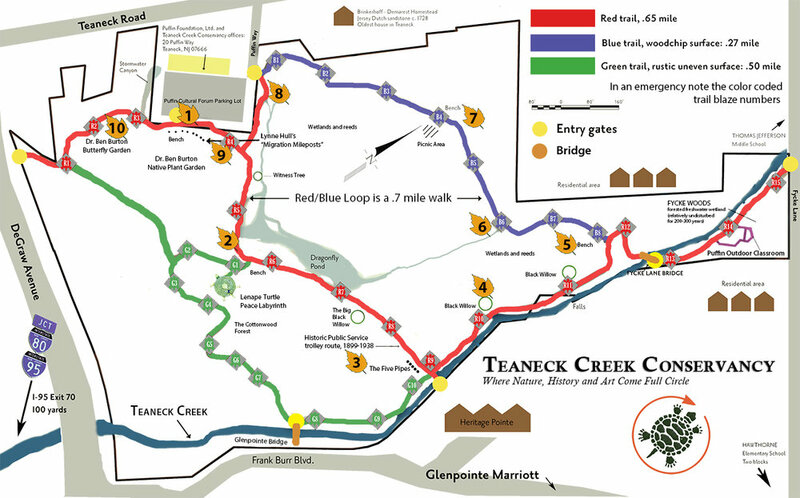 Take a trip into the past as you roam about Teaneck Creek Conservancy! The videos below correlate with stops noted in our map! You can listen to the words or read along (closed captioning available on all videos). Take a walk through the park or take a break on a bench and learn more about this little urban oasis! The entire tour is just over 22 minutes of audio. This Walking Historical Tour of Teaneck Creek Conservancy was made possible in part though grant funds administered by the Bergen County Division of Cultural and Historic Affairs, Department of Parks, through a General Operating Support Grant from the New Jersey Historical Commission, a division of the Department of State. Images have been provided by the Puffin Camera Club, Teaneck Creek Archives, open source images, Philip Beamer, Dee De Santis, Alexa Marques, Sarah Davol, and Mary Thurmond.